Product Details: Indulge your inner Francophile with these ornate 2 ½" sparklers. 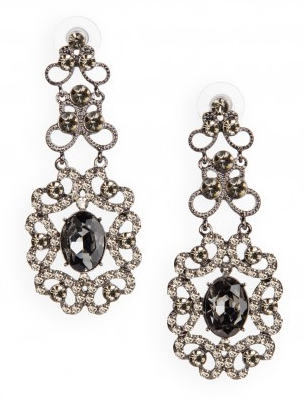 Inspired by the popular Versailles Earrings, this chandelier design boasts new, yet equally stunning, charcoal crystals. 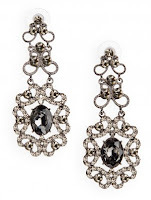 Teamed with your favorite LBD or LWD, this black hematite pair hits the mark. Slip them on like a modern day Marie Antoinette and remember Versailles! You can see visible tug here but I don't find them uncomfortable. My great-great grandmother was a French immigrant. From a very young age the call of my inner Francophile has been drawn to all things bearing a French flavor. But I've always been a champagne lover on a croissant budget. The closest I've come to anything French and fashionable is breathing in my grandmother's Chanel No.5 scent. 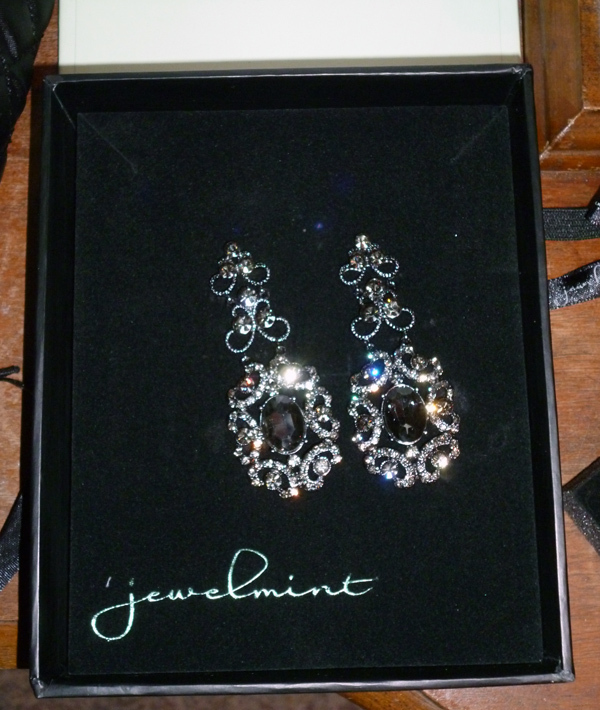 When I joined Jewelmint the original clear crystal version of the Versailles Earrings was the first piece I was completely prepared to buy but it was sold out. 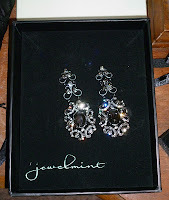 The perfect special occasion earrings at an unbeatable price they seemed destined for my jewelry box. Hunting down someone's extra pair proved to be too pricey and just when I gave up hope they re-released them in this hematite and smokey crystal version. I snapped them up immediately, fearing they would sell out overnight if I didn't. As of the time of this review they're still available so make sure you pick up a pair soon if you like them! The photographs from Jewelmint do them no justice. The color just looks too desaturated to give you a good idea of their true hue. The central stone is a black crystal but the others are a soft smoky charcoal color. Against the hematite the stones have real pop. Even the photos I took without the flash caught sparkles. While perfect for evening attire with their dark elegance, this version can be dressed-down with ease. 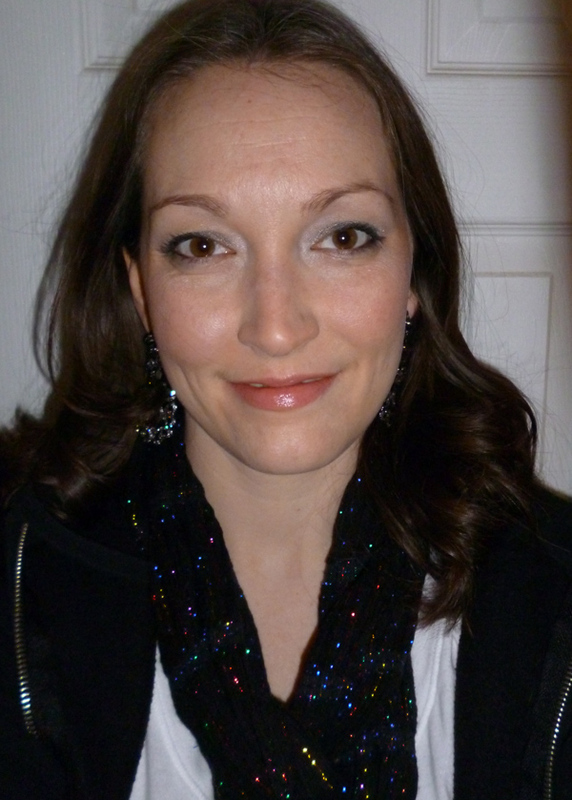 I wore them with a white tee and a black scarf with metalic threads in it for a day of errands. They make an elegant statement and I think wearers with lighter hair coloring would get even more notice from them. Backs were off when they arrived. The only major flaw I found with them is that they are quite heavy, heavier than the originals (which I was able to catch in a Daily Deal set). I believe it's the difference in the metals used. 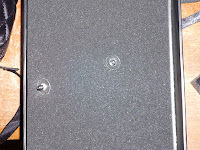 The backs do not stay on well either which may be in part from the weight. To keep mine from falling off I added a set of the clear stoppers used on fishhooks to the end of the posts and had no further trouble. You can buy packages of them just about anywhere, my husband picked mine up at Walmart and I've seen packages of 100 on Amazon for under $3. If you missed out on the original Versailles I would highly encourage you to purchase these. They just scream Femme Fatale. 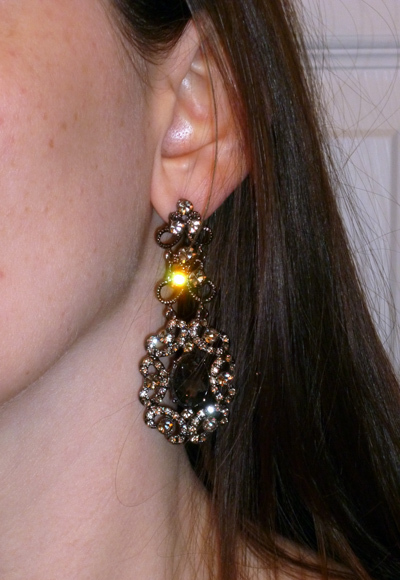 Every time I've worn them I've received compliments and I love the versatility of such a glam, blingy earring. I sort of picture them as the devil-on-your-shoulder version of the originals, just a bit more naughty, possessing a deliciously je m'en fous vibe perfect for those with a more rock-chic style when it's time to dress-up. Notes: I am not being compensated for this review. This product was purchased by me.